Since the number of domesticated plants and animals is very small, it makes sense to find uses for more kinds of creatures, rather than trying to monocrop the environment for the few species we respect, while trying to eliminate the rest. In terms of animal foods, we rely mainly on four or five species of land creatures, plus many kinds of fish. Since there are at least three million animal species, it seems there’s a lot of God’s creation that we don’t like. Out of about 80,000 possible food plants, we depend to an enormous degree on just eight. And of these eight (wheat, rice, corn, potato, barley, cassava, sweet potato, and soybean), only cassava is not increasingly at risk from rising temperatures and UV radiation. But since many cultures of the world use different creatures than we do, there’s a decent chance we can expand our options by watching others. Probably the most important source of food that we’ve tried to eliminate is insects. Insects make up at least 90% of all animal biomass on land. They’re the plankton of the terrestrial food chain, but as food we typically see them as beneath our contempt. Eating insects was traditional in many cultures. But recently, most people around the world got the idea, probably from the liberal media, that eating such meat is not respectable for modern man. As townspeople in Sabah state (of Malaysian Borneo) say of their forest-dwelling, insect-eating neighbors, “Eating insects is disgusting, primitive and weird.” At least TV shows like Fear Factor and Australia’s Bush Tucker Man tend to present it as challenging rather than depraved. In Japan or Indonesia, rice farmers traditionally controlled grasshoppers in their fields by eating them. In southern Mexico, many farmers do the same. They avoid spending money on pesticides while gaining a food source that can be worth around $3,000 per year. Especially in Oaxaca state, people fry the grasshoppers (or chapulinas) with garlic, lime juice, and salt, mixed with an extract of the agave worm. They munch the chapulinas as a snack, or sprinkle them as a topping on tortillas with refried beans. With a similar attitude, the Paiute Natives of the US Southwest managed to stop the USDA Forest Service from spraying insecticides against pandora moth caterpillars, since these insects are a traditional Paiute food. Basically, these traditional farmers feel it’s inefficient to spend money on chemicals to destroy insects that have up to 75% protein, in order to protect crops that contain 14% protein or less. 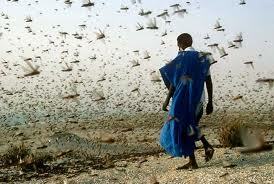 In the 1970s, Thailand suffered a major plague of patanga locusts, and aerial spraying showed little effect. The government then urged people to eat the locusts, as had been done in the past. A publicity campaign promoted the use of locusts for deep-fried snacks, as a ground-up ingredient in crackers, or as a cooking sauce. The campaign basically worked. Patanga locusts became a popular food, and are no longer considered a major pest by most farmers. More recently, around 20,000 families in Thailand took up commercial cricket raising. These tiny ranches require only a few hundred square feet of yard space. The farmers make cricket hutches out of containers filled with loamy topsoil. They add cricket eggs on top, then cover the containers with grass, bamboo shoots, or egg cartons. Last they drape nylon netting over the hutch. As the crickets grow, they need only a little chick seed, some extra grass or weeds, and a little water. If the weather is warm, they’re ready to harvest in four to six weeks. In two villages of Thailand’s Khon Kaen province, 400 participating families raised 10 metric tons of crickets, and their income varied between $300 and $1,600 (US) each. 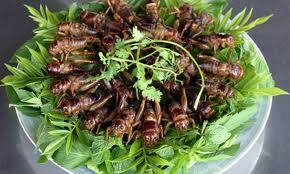 The crickets sell well in urban markets, mostly as a fried snack that people eat with beer. 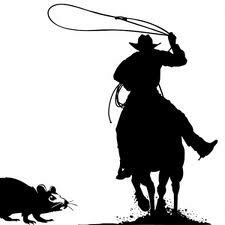 For those who insist on redder meat despite having very limited budgets, the good news is there’s always rodents. Governments in central Africa encourage use of “mini-livestock,” such as Gambian giant rats or cane rats, to increase food supplies. The English aid agency Send a Cow has recently helped African families by soliciting Christmas gift donations of small farm animals such as rabbits, chickens, or cane rats. Concerning the popular cane rats, Kirstin Dunhill explained, “They’re much bigger than the rats we know in the UK and we fund them in Cameroon, where they are farmed.” She said that by making the jungle rats into livestock, the villagers find less need to hunt bushmeat in the forest. There’s less damage to forests from traditional slash and burn hunting methods, and less dependence on killing endangered species such as apes for food. Perhaps this heralds the great commercial rodent farms of the future. However, when British food inspectors found that stores in the Ridley Road market were selling cane rat meat from Africa, Dr. Yunes Teinaz said “It is disgusting and outrageous that the local authorities don’t take action and remove this meat from the human food chain.” The Market’s shop owners were in denial. 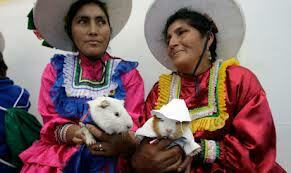 One of them said, “I don’t sell rats. I never sell rats … I don’t have any rats, why you come to video me?” Meanwhile, the French chef André Simon, in his Guide to Good Food and Wines, advised roasting black rats with a stuffing of breadcrumbs, minced rat livers and hearts, sweet herbs, and a touch of salt and pepper. For people of open minds, it’s just a matter of making the best of what you’ve got. BBC News (2008) “Thai diners show appetite for rat.” February 6. BBC Local Bristol News (2006) “Rats and Toilets Make Great Gifts.” January 20. Chung, Arthur Y.C. (2008) “Edible Insects and Entomaphagy in Borneo.” In Forest Insects as Food: Humans Bite Back. FAO (Food and Agricultural Organization of the United Nation), Chiang Mai, Thailand, p. 142. Johnson, Dennis V. (2008) “The Contribution of Edible Forest Insects to Human Nutrition and to Forest Management.” In Forest Insects as Food: Humans Bite Back. FAO (Food and Agricultural Organization of the United Nations), Chiang Mai, Thailand, p. 12. Lynn, Guy (2012) “Cane Rat Meat ‘Sold to Public’ in Ridley Road Market.” BBC News, September 17. 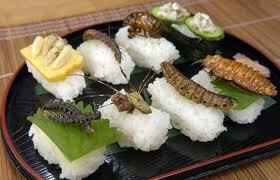 Mitsuhashi, Jun (2008) “The Future Use of Insects as Food.” In Forest Insects as Food: Humans Bite Back. FAO (Food and Agricultural Organization of the United Nations), Chiang Mai, Thailand, p. 115. Premalatha, M., Abbasi, Tasneem, Abbasi, Tabassum, Abbasi, S.A. (2011) “Energy-efficient Food Production to Reduce Global Warming and Ecodegradation: The Use of Edible Insects.” Renewable and Sustainable Energy Reviews, 15(9), pp. 4357–4360. 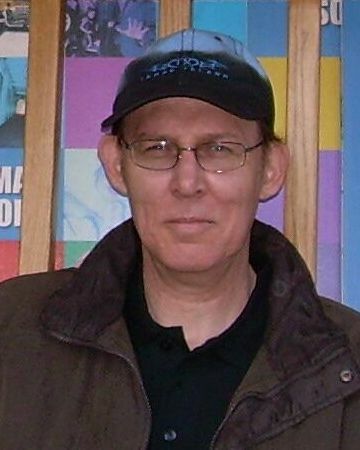 Steinfeld, Henming, Gerber, Pierre, Wassenaar, Tom, Castel, Vincent, Rosales, Mauricio, de Haan, Cees, (2006). “Livestock’s Long Shadow: Environmental Issues and Options.” FAO (Food and Agriculture Organization of the United Nations), Rome. Available at http://www.fao/org/docrep/010/a0701e00.HTM.